The SoCo Certified Farmers’ Market (SoCo CFM) is locally run by Sprouts of Promise Foundation, a non-profit organization dedicated to supporting small farmers and healthy eating. Farmers sell only certified California grown agricultural products directly to the public every Saturday. You can find everything from seasonal fresh fruits and vegetables, local raw honey, fresh cut flowers, to cage-free eggs and pasture-raised meat. SoCo CFM also features the best of local Orange County gourmet food trucks and artisan foods such as freshly baked breads, hummus, and a variety of sweet treats. 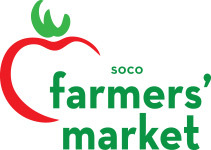 SoCo CFM was rated one of the best farmers’ markets in Orange County and featured nationally in the New York Times. Shopping locally at the farmers’ market supports California’s small farmers and positively impacts our local Orange County food system. Visit us every Saturday from 9am-2pm.